All OES frame sliders are machined from high-quality plastic. We use virgin UHMW plastic, which means that the plastic rod stock used is not made from ground-up bits of recycled plastic. This allows us to offer a product with a very nice finish. All OES frame sliders use 6061 aluminum spacers which are pressed into the slider. The spacer is a very critical part of any frame slider. Without the spacer, the screw or bolt that holds the frame slider on, which is an engine mount screw/ bolt, will never remain torqued. This inability to remain torqued is due to the slider base deforming under the pressure of the screw or bolt. We know of some frame slider manufacturers who recommend light torque in combination with thread locker for their frame slider mounting screws/bolts. Why do they do this? Because they don't use spacers. The slider base will deform easier with the actual recommended torque specifications, so they will recommend much lower torque, hence the need for thread locker, so the frame slider doesn't fall off while you're riding the bike. This may seem like an easy enough remedy, but it is not. Even if the torque applied is only 20 lb/ft, the slider base will still deform and the frame slider will become loose. Once this happens, vibrations due to the engine mounts being loose will lead to failure of the screw or bolt, and the frame slider will still fall off while you're riding the bike. So, the point is, without a spacer pressed into the frame slider, the frame slider cannot be properly mounted to the bike, and the bike will have two less motor mounts than it had from the factory. Then why would any manufacturer leave the spacer out? The answer is lower production costs and manufacturing time. 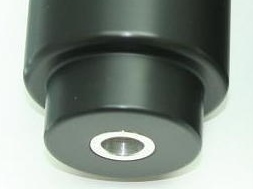 Below is a picture of the base of an OES frame slider, which shows the pressed-in 6061 spacer. At OES, we like to apply a high level of craftsmanship, such as this, to all of our products. Yeah, but do they work? We've had hundreds of crashing customers over the years who have proven the fact that our frame sliders work, even our own crashing has been part of the R&D process. We've come to realize that in a lowside crash or simple drop the sliders work well but if the bike flips through a gravel trap or ends up at the bottom of a canyon, the slider won't do much for that kind of crash. (sample photos and a video at bottom, many thanks to our customers for the pics and video). "Dumped my 2 week old FZ-09 in a corner today on my way to my first day of school. Thanks to my sliders the bike took very minimal damage. Cant say enough good about your product!" "Thank you for making great products, your sliders saved my bike. You guys saved me hundreds if not thousands of dollars in repairs." "Thanks! This is my second set! These frame sliders saved my bike! Went down at 45 mph and only received minimal damage! Thanks OES!" "Sliders worked fantastic after lowsiding! So thankful these sliders held up. Will not go without OES Sliders. Thank you!" ​"Your frame slider saved my bike from so much damage when it was knocked over....thank you for making such a great product!!!" 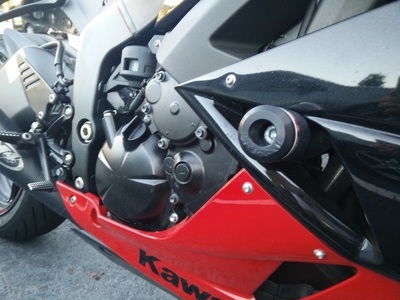 ​"I recently bought a pair of front and back frame sliders for my Yamaha 2014 fz09 from you guys a couple months ago. I recently lowsided and first of all I want to say thank you for such an awesome product. 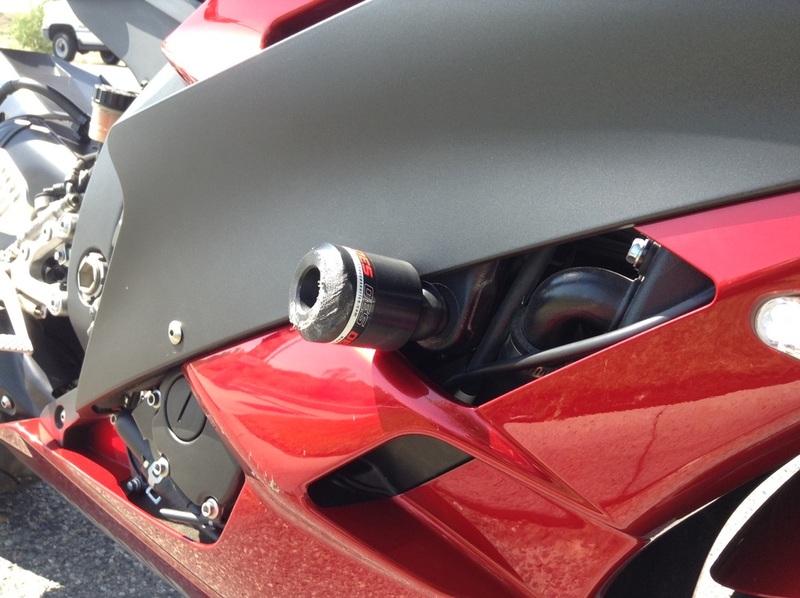 My bike was nearly untouched and the front and back frame sliders took most of the damage on the right side." "Thank you for saving my left leg. I was recently in an accident and your frame slider protected my left ankle and leg from likely being broken or worse." "Your frame sliders saved me thousands of dollars in damage. Thank you for making a quality product." "I have bought two pairs of your sliders for my '07 FJR. The right side of the first pair totally protected my bike when it went over in a zero speed fall. I then purchased another pair right away knowing the protection they provide. Prior to my first purchase with you, I did buy a less expensive pair on ebay. What a difference!!! As you mention in your post, they were light weight and cheaply designed. When I did order yours I wondered why they were so much more in cost and now I know why. Because they work!!! I love my bike and could never see myself putting the inferior sliders on, hoping they work, just to save a few bucks. I just wanted to say what I think about your product and how secure I feel seeing them on the side of my ride. Thanks again for doing it right..."
"I installed a set of those on my 2003 Yamaha FZ1 in August. I unfortunately had an accident last week, low siding on sand covered road. The frame sliders did an excellent job, protecting the pegs, engine and radiator. The bolt holding the frame slider bent about 45 degrees but did not break, and about 1 inch of the slider got sanded down by rubbing against the pavement. I was going maybe 35 mph when the bike lowsided. The only damage to the bike was a small scrape on the clutch cover, a bigger scrape on the (stock) exhaust, a broken fairing and slightly bent handlebar (and badly scrapped but still functional brake lever). There was no damage to any of the engine or transmission parts. The tank also had no damage. A friend was able to ride the bike back home with no issue (I hurt my shoulder so I could not ride). I inspected the frame in great detail (all solder joints) and there seems to be no damage as well. I was not sure plastic was the right material for this, but it did the job very well. Highly recommended." "Dumped my Speed Triple on Thursday night, just wanted to say thanks a lot. Of course there was damage but nothing compared to what there would have been if I didn't have your sliders on." "I've been using your sliders on every bike I've owned since I started riding in 2003, I just bought a brand-spanking-new ZX6 and was really glad to see that OES had full coverage for my bike, I bought every slider that you had. I'm very glad I did. I'm writing because I just wanted to let you know about how well your sliders performed on a pretty hairy crash at Summit Point. I was rounding turn 7, an off-camber right-hander and lowsided at about 50. Your sliders were long enough, which allowed me to get my right leg out from under the bike before I hit the gravel. They were also long enough to protect all (!) of my fairings from damage, I had the slightest scratching on one upper fairing from grass and gravel, no contact with the track at all. The slider gave it up like it was supposed to, but didn't get torn off or rotate under the load, she held strong and saved my bike. This was the type of crash that ruins your frame.Your swingarm sliders saved my exhaust, allowing the exhaust cover and the slider to take most of the hit. Needless to say, I'm really happy about you saving me $10K. Thank you for manufacturing a quality product, as well as offering reasonably priced replacement parts. I will continue to use OES products and recommend them to my customers as well as my friends. As a mechanic and wanna-be racer I appreciate the design, fit and finish of all your products, keep up the good work." "Just wanted to send this pic so you guys can use it if you want. 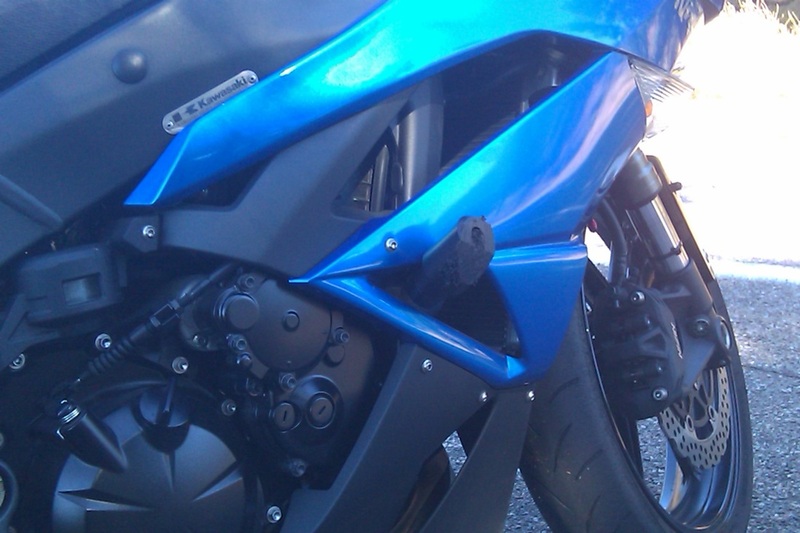 Your product saved me thousands of dollars to my beloved 2009 ZX6R- not a scratch on the plastics, frame, or rims. Just a new slider and a new foot brake pedal under $120.00 total repair. Thanks." 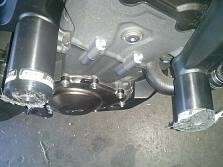 "I crashed my 2007 CBR600RR while going 60 mph at Calabogie Motorsports Park. When my bike hit the grass, the tires caught and the bike flipped over pretty hard. My OES Accessories Slider kit prevented my bike from receiving a lot of damage. My swingarm, engine cases, forks, rotors, and rims are untouched and look like new. My OEM rearsets are not at all bent. The only damage to my bike was a rashed bar end, a ground down frame slider, and some rash on my track plastics. When I put my street plastics back on and cleaned the bike up, no one could tell that it had been in a 60 mph crash. I am now placing my order for another set of OES Accessories frame sliders (my swingarm spools and fork sliders are still in good shape). The best part about this is the great customer service I receive through OES Accessories. They are on top of their emails and they ship out orders really quickly. I have bought from them twice in the past, once for the whole slider kit and once to replace a swing arm spool that fell off because I forgot to loctite the bolt." "I received my replacement slider for my '08 B King today. You and your product are second to none! My bike survived a 35 mph low side crash with no significant damage other than the ground down slider. Witnesses said the lack of damage was miraculous. I did not fare as well but am mending rapidly. Your support service has also been exemplary." "I purchased your sliders and recently lowsided. To my amazement, there was very little damage done to my fairings. So little in fact, they don't HAVE to be replaced. I may just hit them with some touch up paint and they should be good to go. Great products, thanks!" "Just wanted to thank you for designing a good product that holds up. I am reordering these sliders from you to replace my last set that I purchased from you last July. A couple of days ago I dropped my R6 when I hit some black ice when turning a corner at moderate speed and thought for sure my frame was trashed. It must have skid 20 ft or more on its side. When I picked it up there was no damage to my frame minus some scratches on my turn signal and bar end, but the slider was skinned half way down. 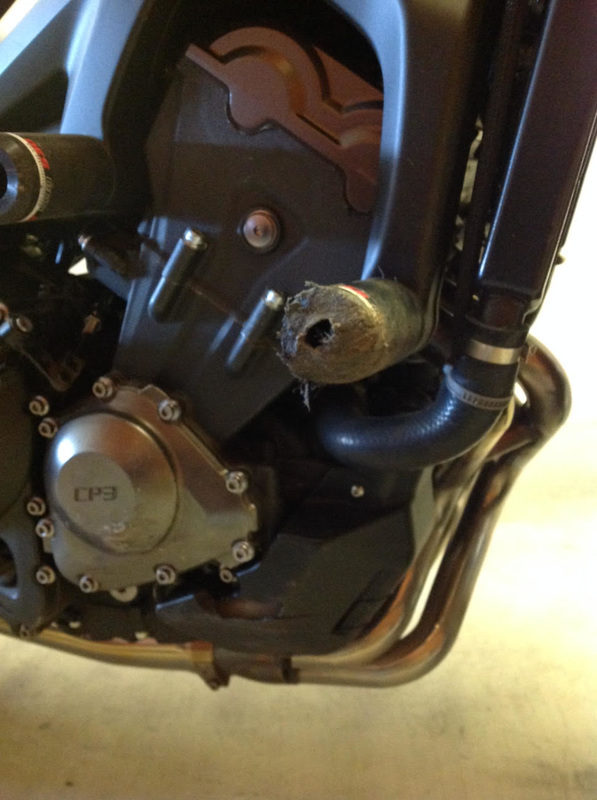 The spool I had on the rear of the bike from another vendor was completely broke off." 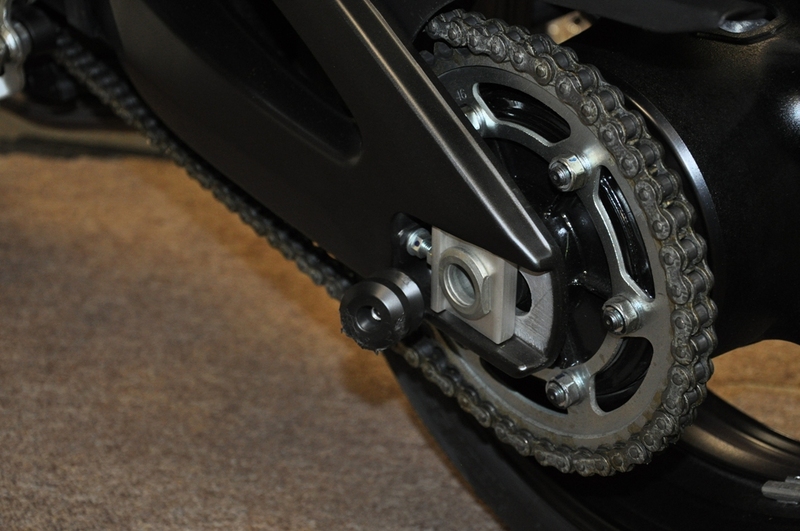 "Thought you'd like to know, I fitted a set of these to my FZ1 last week and crashed 3 hours later. The sliders saved me a fortune in crash damage to my bike. Thanks for a great product." "Thanks a lot! Your sliders saved me from a TON of repairs.. My cowlings took some scraping but that was from a curb. Without the sliders it would have cost me around $1400 in repairs!" "Just wanted to thank you again for the great frame sliders I bought a year or so ago. They came in handy last night when I was on the R6 and was hit by a ford explorer. I contacted the truck with the nose and fell on the left side. The sliders did a great job. 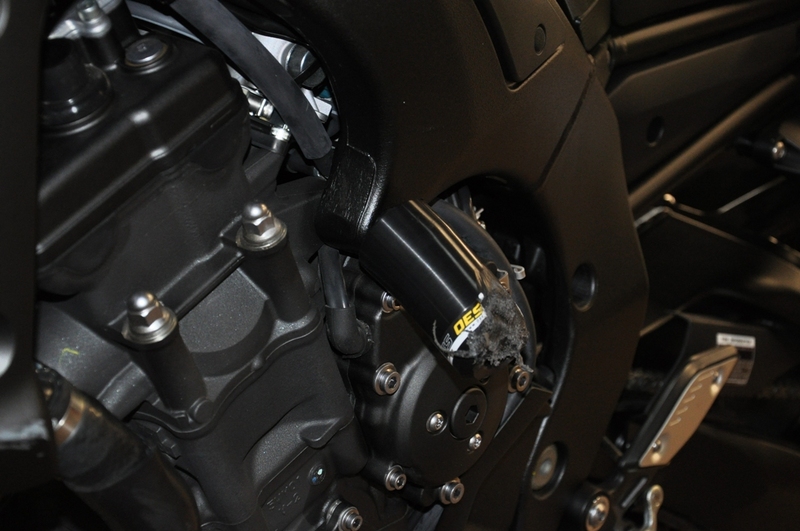 Landing on the engine and swingarm sliders w/o a mark that I can find on my plastics. Looks like some minor plastic work to the nose a check of my forks and she will be on the road. I've told them to order my replacement sliders from you when they get the insurance check. Nothing like some inexpensive piece of mind that you can trust." "Your frame slider worked wonderfully! There were no damages to my fairing at all!" "Ya, was taking a left hand downhill loop turn this weekend at Mountain View in Arkansas and my front slid on gravel a little then got traction again and threw my bike and I to the right. The slider took a hard hit and worked beautifully." "So my brother in-law put the B-King sliders I purchased from you into use when a coyote ran in front of him at about 60mph. I can tell you that they did save him some money in damages. I was VERY impressed with how much the rear spool slider saved. The damage was under $500, and if the sliders were not there, I think the bike would be totaled." "Just wanted let you guys know....your frame sliders on my girlfriend's bike, saved it from major damage when the bike hit the wall at the exit of T6 at Nashville SuperSpeedway during the STT trackday on Aug. 2nd. She bought replacement sliders from you a few weeks ago and I've got them installed again. Now I'm buying some for my 600RR streetbike." "I am writing to describe how well OES sliders worked for me. I ride a Suzuki B-King and low sided at 40 mph or so. The left slider wore down about an inch but otherwise was intact. 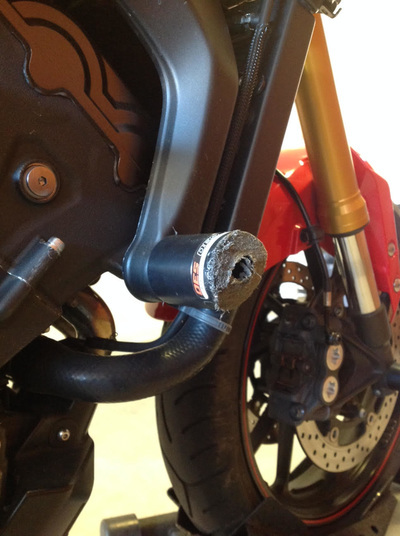 No damage was sustained to the side of the bike except for the nob sticking out from the shifter. The bike must have slid at least 75 yards. I was able to ride the bike and finish my trip, which was about 400 miles. Thanks OES!"